Did you ever wonder what it feels like to be a toddler again? Of course that includes the fears of the unknown. Nothing is what it looks like and everything is interpretable. 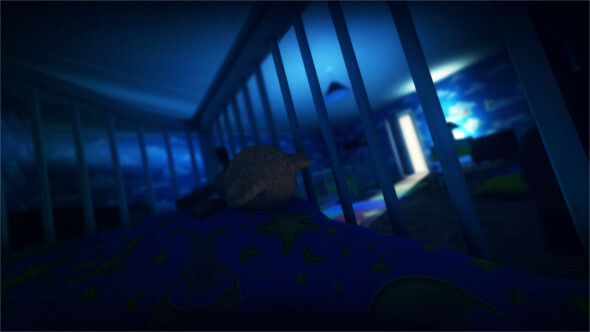 Among the Sleep takes you on a trip through the less pleasant parts of a toddler’s mind. The story begins as you celebrate your birthday. You see your mother, a nice lady with a calm voice giving you some birthday cake. Before long someone knocks at the door. Mother seems unsettled as she goes to look who’s there. After you hear some rambling, she returns with a present for your birthday. In the beginning everything seems a little confusing and you don’t really have an idea of what’s going on. A little bit further you find yourself in the middle of the night looking for your mother, she has disappeared and you have no idea where she could be. In order to find her, you have to look for memories, which will allow the story to unfold. And thus as the story progresses, there seems to be a lot going on. Mother doesn’t seem to be as great as you think she is, she has some real issues such as a drinking problem. While walking around in the game, all the terrifying things you see are representations of your real world fears and traumas. For example the game is filled with bottles of liquor. The present contained a teddy bear called Teddy, a gift from your father. He is the one who makes you feel safe from the terrors your mother brought upon you. It’s pretty clear that your parents got divorced not so long ago and that mother is taking it up really hard, which might be the reason of the alcohol. And because of that you are forced to find your path through a world of fear. 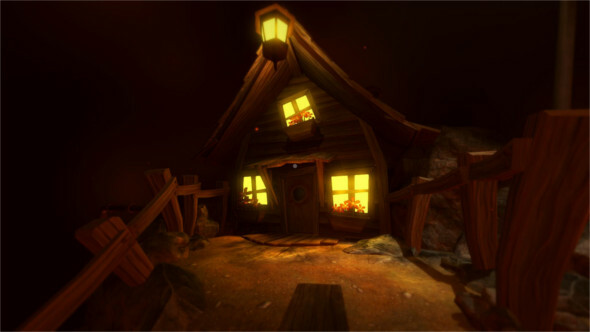 Krillbite Studio chose for a cartoony style, which fits perfectly in a game where you see through the eyes of a toddler. It also give the creators a lot more freedom and arranges a lot of tolerance for “mistakes”. Except for the (somewhat creepy) design of the mother, the design of all levels and objects are done greatly. The levels are a mix of harmless locations and terror. Everything seems so big since you are so little, it shows how everything can look intimidating to an infant and more importantly gives the player an uneasy feeling of defenselessness. It’s instantly clear that there has been put a lot of effort in the sound. Considering that the game would support Virtual Reality it’s very important that the sound is 3D too, and it is. A headset is defintely recommended, it sets the mood for a horror game but next to that it’s going to be a big plus in Among the Sleep. When you’re walking through the levels everything feels really alive, at moments you feel so tranquil because of water sounds or creaking wood. But when you’re in a dangerous situation it can all change in an instant, every little sound will suddenly sound suspicious. The music on the other hand is kept rather simple; in general it’s a mixture of a lot of bass, and eerie treble as well when danger is approaching. Next to that there is some distorted humming, barely hearable discussions and children’s voices. These sounds are related to your real world memories. 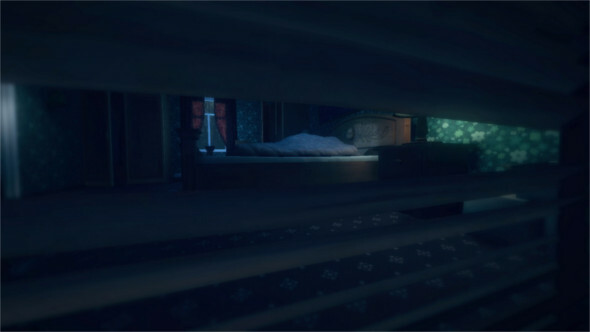 Among the Sleep is a game that’s about exploring and walking down a road of terror, difficult challenges aren’t important to this game. The only sort of puzzling is having to find an object and make it interact with another. Since the game is rather simple, the controls and mechanics aren’t complex. You can run/crawl, climb, open your inventory and take your Teddy to comfort you, no need for anything else. After all, you’re playing as a toddler. In general the movement speed is pretty spot on. Running on your feet is the fastest, but look out, you will fall to your knees if you do this too long. Since there is a bit of animation for getting on all fours or standing up it could mean valuable time. Climbing up on objects also costs some time and because you look down to where you are climbing on, there’s always the possibility of a surprise waiting for you when you look back up again. When you first get to control your character you’ll find that Teddy is alive and he’s trying to play with you; this serves as an original tutorial. As he makes you play hide and seek using a pink stuffed elephant, you learn to run around and use escape to cover your eyes (pause). After that he walks up to a little traintrack and asks you to interact with it. Finally he asks you to get in the closet, here you learn that you have to move chairs or boxes around to reach certain knobs. And finally inside the closet it gets dark and scary. Teddy notices that you’re afraid and suggest that you hold him close to you, this action emits light and helps you calm down. If you think playing as a toddler means you can’t die, then you are sorely mistaken. There are areas where you can fall or drown and next to that there are monsters running around. These monsters try to catch you when they see you, every time a monster sees you the audio gets really eerie and your screen gets distorted. Every object is really big which gives you an immediate feeling of helplessness. You can move chairs and other objects but they’re usually pretty heavy meaning that it takes some time to move the object to where you want it to be. You’ll also need to climb on a lot of things because you are so little. In short, the gamplay is exactly what you would expect from this kind of game. 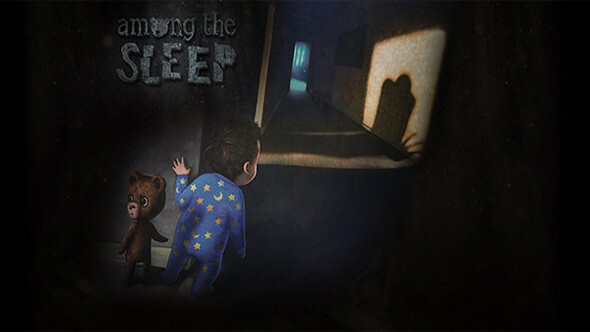 Among the Sleep takes the traumas of children and pours them in a nicely executed game. The graphics aren’t especially good, though the audio definitely makes up for it. The story is simple, which makes it easier to just walk around and absorb the wicked world that you’re in. And instead of solely jump scares, Krillbite Studio made good use of psychological fears. This was a great game and is recommended to anyone in search of an alternative horror game.